Earlier this year, I was published for the first time in Corporate Knights magazine. In “Celebrating The Next Era of Sustainability Leadership”, I outlined my perspectives on the evolution of sustainability leadership and the potential for the SDGs to become a common language for the entrepreneurs, corporate intrapreneurs & investment firms that are leading this new wave of change. These beliefs underpinned the development of The Global SDG Awards – a platform developed to support, nurture & reward companies for their sustainability leadership. Today, I’m proud to reveal a sneak peek of the candidates participating in our 2018 competition. Please take a moment to learn more about the incredible companies that are inspiring and influencing real, systems-level change. Members of the food and agriculture sector are showing incredible dedication to improving their communities and the world. Brewers MillerCoors, Toast Ale and GROSCHE Coffee and Tea pour purpose into everything that they do. AeroFarms and Ripple Farms are transforming the way we think about farming, and Anuvia and Carbon Gold help other farmers do the same. It’s no surprise that the energy sector has positioned itself as a sustainability leader – just ask America’s Secure Futures, India’s Clean Max Solar and Canada’s Em-One. Serving the world’s most vulnerable regions, Azuri (sub Saharan Africa) and Envirofit (Africa, Latin America and Asia) solve enduring energy problems using technology for a brighter future. Increased demand for solar energy led to the development of Ecoppia, which offers robotic solar panel cleaning to increase the industry’s profit margins & overall efficiency. ChargeLab offers electric car charging solutions while Bird offers a sustainable solution to public transit’s “last mile” problem (a common challenge for commuters in metropolitan areas). Mining companies are also making big changes to support a healthy planet and a healthy workforce. Look no further than Lundin Mining or GoldCorp to see the positive impact this industry can have (Goldcorp’s Borden Development Project will be Canada’s first all-electric underground mine). With trans-national supply chains, fashion and beauty industries have the power to enact real positive change around the entire globe. Outland Denim helps lift their seamstresses out of poverty while C&A’s mission is to make sustainable fashion the norm. Brave Soles seek to eliminate waste in the development of their products, and Evrnu breathes new life into discarded textiles. The same is true for All Good Products and Beautycounter, who offer sustainable products (alternatives to sunscreen & makeup respectively) that eliminate the harmful chemicals that are still industry standard. Offering meaningful answers to companies most enduring questions, many business solutions firms are embedding sustainability into their daily operations. To remain competitive is to be digital – FIIX Software, Emerge and EPAM have impact through their integrated technology solutions. The rise of the digital age has also driven the development of Ecosia (a search engine that plants trees), Participate (a platform that empowers students & teachers to reach their full potential) and Mommy Monitor (a pregnancy and motherhood tracking smartphone app). LeanPath and Winnow Solutions help food services reconsider food waste. Green Standards offers new life to unwanted office furniture, and Plastic Bank reveals the value of discarded water bottles. Umicore and FLEX solve the resource scarcity puzzle by transforming industry and electronics waste into usable products. Let’s talk about sustainable travel! Better Places provides their clients with sustainable travel experiences with curated, local features. In Vietnam, Manta Sail Training Centre includes environmental education in their sailing experiences & engage local fishermen to track & monitor marine wildlife. No tropical vacation would be complete without catching a few waves. FireWire Surfboards uses a 100% recyclable epoxy resin, and is pursuing a “Cradle to Cradle” manufacturing approach to reduce their environmental impacts. Helping all of the above companies spread their messages around the globe are the telecommunications firms that connect us all. Canada’s TELUS and Afghanistan’s Roshan are finding unique ways to leverage communication technology for good. TELUS’ “Mobility for Good” program provides at risk youth with mobile phones & data plans. Roshan is offering the people of Afghanistan access to a world of new information and supporting gender equality through education. Is your company a sustainability and SDG leader? It’s not too late to demonstrate your leadership! 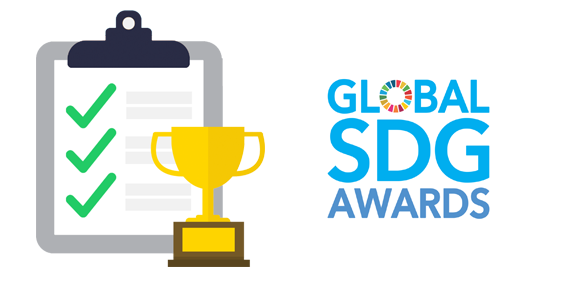 Due to incredible interest, the deadline to apply for this year’s Global SDG Awards has been extended to this Friday, November 9th, 2018. You can find out more information about the application process, and the individual submission questions (available for download) on the Global SDG Awards website. David Klar is a sustainability leader with deep industry ties, active values and an advanced knowledge of corporate responsibility best practices. With more than eight years of experience in sustainability, David has worked for large Canadian retailers and recently was the Manager of Programs & Membership at Canadian Business for Social Responsibility (CBSR). David founded The Global SDG Awards in 2018 to increase private sector engagement with the United Nations Sustainable Development Goals (SDGs) framework through competition. The Global SDG Awards’ mission is to create a race to the top and to inspire others with examples of next generation sustainability leadership. David holds a Bachelors or Environmental Studies from York University and a Masters of Science in Industrial Ecology from the Norwegian University of Science and Technology (NTNU). Ready to Start your Global SDG Award application? Click on the button below to create a new account.